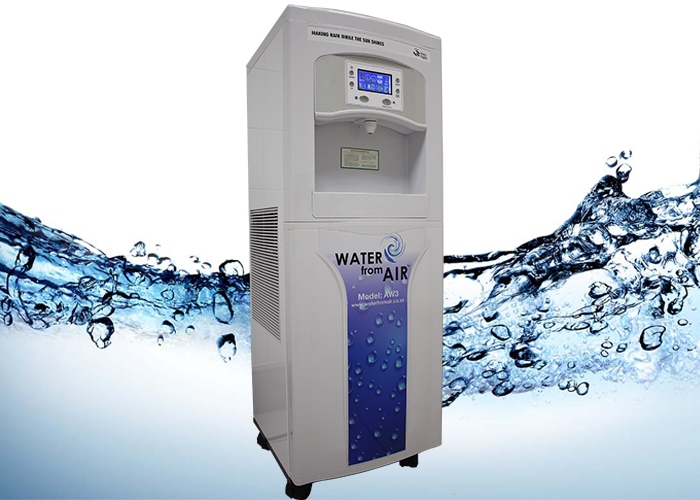 Imagine just for a moment harvesting your own soft, purified water for your customers, staff or in your own home. Our bodies are made up of 75% water, and we often forget that water is the most valuable, precious and life saving resources we have. As the worlds population and cities expand, the threat to our pure drinking water has increased. We now look to tap water or bottled water to supply us with drinking water. The challenge we have though can range from drought, ageing infrastructure, pollution and trusted bottled water suppliers. All these combined have put us in a position that we may not be able to trust what we place in our bodies in terms of water. The AW3 is essentially a purification plant that is a plug and play. The machine draws water vapour straight from the source (the air) and converts this into water. This water then passes through carbon filters, TCR filter and reverse osmosis. It is also sterilised thoroughly through 3 UV lights, removing pathogens, algae and bacteria. Water vapour, available in the air is drawn into the machine. Once the lower tank is full, the water passes through both pre carbon and post carbon filters.